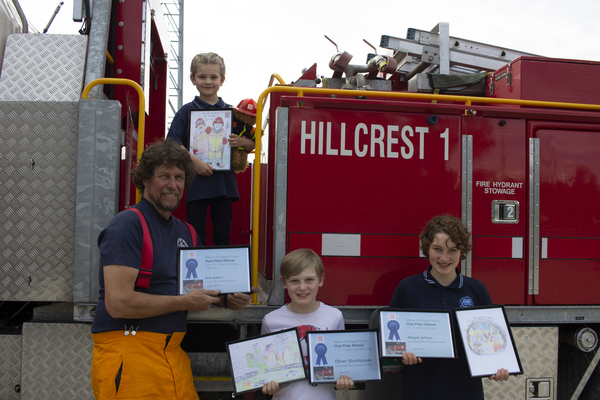 Hillcrest Fire Brigade’s art competition is raising fire and emergency awareness. The contest is now in its third year and the crew announced the winners during its open day on 11 November. Hillcrest Fourth Lieutenant Andrew Smith came up with the concept to increase fire and emergency awareness in the broader community using the three primary schools in the brigade’s response area as a conduit for the messages. The competition is divided into three levels – Prep to Grade 1 and 2, Grade 3 and 4 and Grade 5 and 6. The tasks set for each level are aimed to stimulate inquiry into fire and how to deal with it in a way that suits the different age groups. The tasks change each year. This year the brigade asked the first level to colour in a line drawing of two CFA firefighters. The Grade 3 and 4 entrants created a superhero firefighter with whatever superpowers they needed to combat fire. The Grade 5 to 6 entrants designed a logo based on how to contact the emergency services. “As a brigade, one of our core responsibilities is getting the fire safety message out to the community and this allows us a way to start the conversation in the family,” Lt Smith said. “One of the best ways to be prepared for a fire emergency is to have an understanding of fire. He said the Don Valley, Launching Place and Woori Yallock primary schools had all been fully supportive of the competition, and saw it as a way to engage students and their families in the important fire safety discussion. Kira Forster from Don Valley won this year’s prize for the Prep to Grade 1 and 2 age group. Oliver Stenhouse from Launching Place won the Grade 3 and 4 award and schoolmate Abigail Jeffries won the Grade 5 to 6 prize. The prize pool included art sets, fire extinguishers, fire blankets and a CFA teddy bear. The brigade framed the three winning entries and they’ll be on permanent display at Hillcrest Fire Station, alongside the winning entries from the past two years. The brigade awarded special commendations to Celeste Pyne and Jordon Thornton from Launching Place and Casey Kloet from Woori Yallock in the Prep to Grade 1 and 2 category; Hunter Beers from Woori Yallock and Shae Bextream from Launching Place in the Grade 3 and 4 age group; and Polly Craig and Luca Lambert-Hawksworth from Launching Place in the Grade 5 and 6 group.